As requested by many of our visitors and subscribes, here i am with the single node cluster installation of Hadoop on Ubuntu. What is Hadoop? and also Hadoop tutorial series. The main goal of this tutorial is to start working with hadoop by making a simple single node hadoop cluster even at your home. And start working around with different tools, codes, syntax and software related to hadoop. Note: here i am using ubuntu 12.04 with apache hadoop 1.2.1 (most stable version till date) for running the pseudo node cluster. So now lets get started. Hadoop requires java 1.5+ for its working but Java 1.6 (aka java 6 ) is recommended. So first thing you need in your machine is java 1.6. Check you have java 1.6 installed or not. This will add a user hduser and a group hadoop to your local machine. Hadoop requires SSH access to manage its nodes. So for this single node installation of Hadoop we need to configure the SSH access to localhost. We will be creating this access for the hduser we created in the previous step. After the SSH server installation. 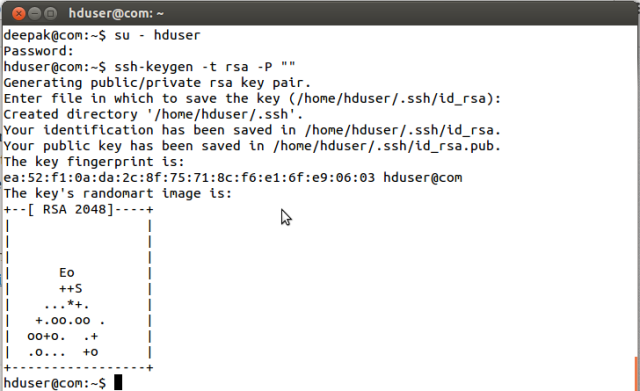 we have to generate an SSH key for the hduser. $ ssh-keygen -t rsa -P ""
Here the second command will generate a key pair with an empty password. Note: Empty key is not recommended but here we are putting the key as empty as we don't want to enter the password every time hadoop interacts with its nodes. Now since the key pair is generated we have to enable SSH access to local machine with this newly created key. For that you have put the below command. So if you have all the above prerequisite in your machine,you are good to go with the hadoop installation. 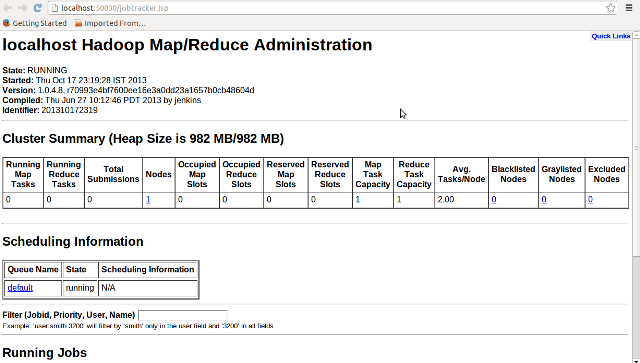 First download Hadoop from HERE and extract the same at any location, i kept it at /usr/local. 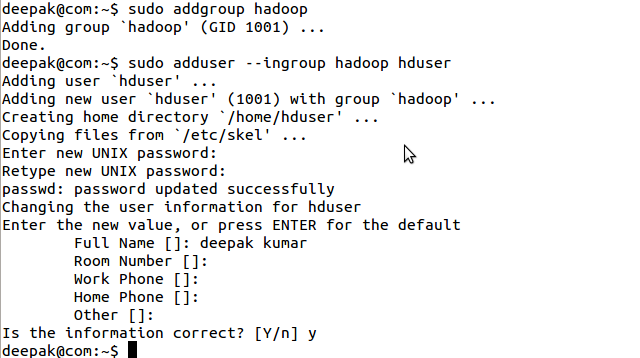 Also you need to change the owner permission of all files to hduser and group to hadoop. Update the following lines at the end of $Home/.bashrc file of user hduser. Well if you are using a different shell than bash, you have to update the appropriate configuration file. Till now we are almost done with the hadoop installation. Now what we have to do is, change a few properties of the configuration file provided in Hadoop Conf folder. But before that we have to make a directory where we are going to save our data on the local node cluster. We will be saving our data on HDFS. So lets create the directory and set the required ownership and permission. Now lets start changing a few of the required configuration file. Note: you will find all these configuration file inside hadoop/conf directory where you have put your file. In my case it is at /usr/local/hadoop/conf. Open the hadoop-env.sh file and change the only required environment variable for local machine installation. And it is JAVA_HOME. For this you just need to uncomment the below line and set the JAVA_HOME environment to your JDK/JRE directory. Formatting and Starting the Single Node Cluster. So if you are done till now successfully, you are done with the installation part. Now we just have to format the namenode and start the cluster. 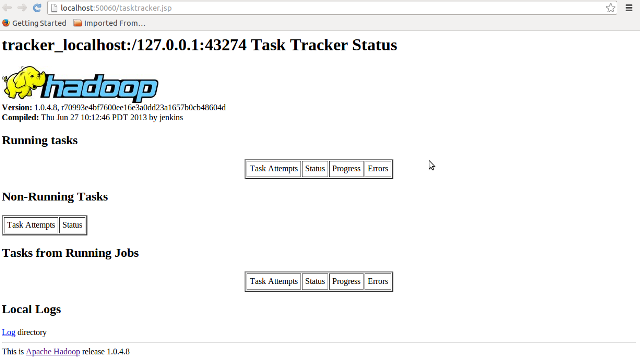 The above command starts the Namenode, Datanode, Secondary Namenode, Job Tracker and Task Tracker on your local machine. you can try using the JPS command to see if these services are running or not. So here you are done with the Single node installation of hadoop on your local machine. Hadoop comes with web interfaces which by default can be seen at the following location. Still getting Error! Try this. Note: After Disabling IPV6 you have to reboot you computer for the change effect to take place. If this doen't work out for you, there are other methods also to disable the same that you can find on net. So these are all the step by step procedure for making a single node cluster at your home and start working on the same. Hope you find it Helpful. @ El mehdi Tantaoui ... Can you elaborate you problem a bit more... What is the error that you are getting ? And have you checked it using JPS on terminal ? Are the 5 processes that i mentioned above running ? i ve completed the entire process and when i try to list the processes using jps, i don't see namenode and datanode. I checked whether they are running using ps -ef; it displays datanode as well as namenode! but they re not displayed with jps command. Help me solve it! Can you please tell me how to install Hadoop on Windows 7? I found many tutorials but got kind of confused. It would be very helpful if you could provide steps for it. 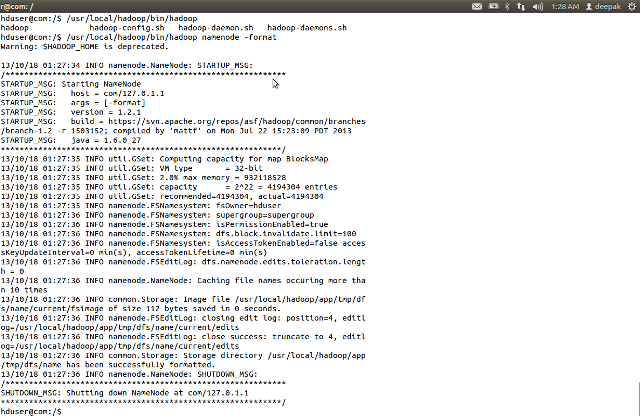 the move command assumed the haddop dir is olderversion 1.03 it should be hadoop-1.2.1?